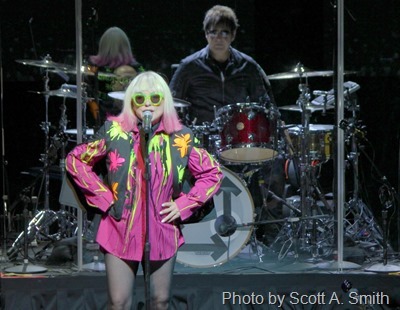 Even with co-founding guitarist Chris Stein absent due to a family emergency, Blondie ignites and dazzles while proudly working as the target of spotlights. Fronted by a confident, fabulous-looking Debbie Harry — she’s 73 yet has retained her youthful swagger — the Rock and Roll Hall of Fame band brought its well-known, well-loved blend of rock, new wave, punk and pop Aug. 9 to the Joint inside the Tulsa Hard Rock Hotel and Casino in Tulsa, Okla. Nearly every seat was filled inside the popular, 21-and-older venue, and every individual in attendance seemingly was captivated by what they saw and heard. Harry wasn’t the only beam source of inspiration and greatness on that Tulsa stage. With Stein away (temporarily, we hope), guitarist Tommy Kessler did all the six-string heavy lifting, providing edgy riffs and, during just the right moments, unleashing some great, wild-man guitar solos. Bassist Leigh Foxx and keyboardist Matt Katz-Bohen kept the songs rooted but refused to be overly strict throughout the set, which included “One Way or Another,” “Hanging on the Telephone,” “The Tide is High,” “Call Me,” “Rapture,” “Too Much,” Gravity” and “Fun.” Thankfully, “Maria,” Blondie’s immaculate comeback single from 1999’s “No Exit” album, returned to the set for the Tulsa show. This live reading of “Maria” wasn’t quite as assertive as the original studio incarnation — maybe the lack of Stein’s guitar was the culprit for those very few moments when Blondie’s sonic wall dipped somewhat in intensity — but “Maria” still packed power and purpose at the Tulsa Hard Rock. And then there’s original Blondie drummer Clem Burke, whose animated, always-inspired drumming is a spectacular show unto itself. At age 63, Burke has lost absolutely none of his incredible drumming skills. He’s fluid and hits the drums and cymbals hard during the more uptempo selections. Burke has a beautifully raw passion while at the kit that never dips in energy. Years and years and years ago, he magically mastered an eye-popping, ear-pleasing hybrid drumming style that still lives in between Keith Moon’s volcanic, early-1970s greatness and Police time-setter Stewart Copeland’s precise percussion work. “Atomic” benefited from the perfect interplay between Burke, Foxx, Kessler and Katz-Bohen, who weren’t the least bit afraid to stretch out from the original studio arrangements here and there. The Blondie members never slid into jam-band territory, but they did seize several moments that sounded like they left a little wiggle room for some improvised notes. Only Blondie’s cover of “From Russia With Love,” the 1963 composition which was featured in the second James Bond film of the same name, wasn’t 100-percent magic. It wasn’t bad at all, but being sandwiched between a bouncy take of the iconic “Heart of Glass” and Blondie’s greatest musical triumph to date, the hypnotic, show-closing “Dreaming,” “From Russia with Love” didn’t dazzle quite as much as it should. The aforementioned “Heart of Glass” and “Dreaming,” on the other hand, were sonic perfection in every way possible. The Blondie gig felt like a celebration both for the band and for the fans. Blondie: 1. Father Time: 0.